Republican Bob Vander Plaats today revealed the name of the new group he will lead in an effort to unseat three Iowa Supreme Court justices. 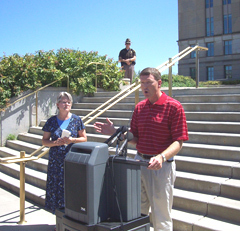 Vander Plaats held a news conference on a sidewalk outside the Iowa Judicial Building to announce his new group will be called “Iowa for Freedom” and the group’s website is already online. “We right now have the resources to run a very effective, grassroots campaign,” Vander Plaats said. Bob Vander Plaats announces the Iowa For Freedom group. Vander Plaats is asking Iowans to vote no on the retention election for three Iowa Supreme Court justices who joined the unanimous 2009 opinion which paved the way for gay marriage in Iowa. Vander Plaats, though, is seeking the support of Iowans concerned about other issues, like property rights and immigration, to join what he calls an effort to reign-in an activist court. This isn’t an effort that’s “done every day,” according to Vander Plaats, and Vander Plaats predicted if it’s successful, similar efforts could be launched to reign in judges in other states. While Vander Plaats said the group already has “resources” — which means money — he isn’t yet revealing whether it’s a political action committee or some other type of organization. This was the second time in less than a week that Vander Plaats held a news conference on the sidewalk outside the Judicial Building. Last Friday Vander Plaats went to that spot to announce he would not run as an independent candidate for governor and would lead an effort to unseat the supreme court justices involved in the gay marriage ruling.